Hello. 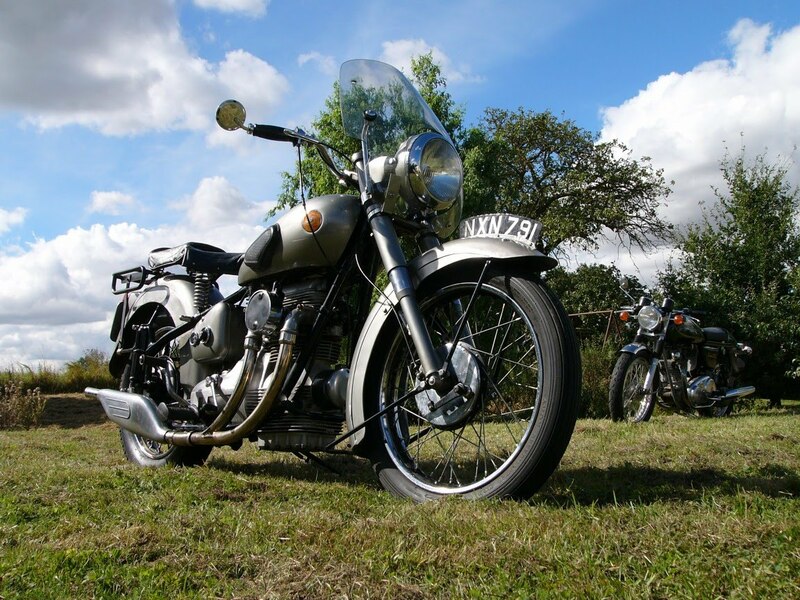 This is the website of a former time-served Design Engineer who in his later years specialised in recommissioning &/or restoring (R & R) post-war S7 & S8 Sunbeam motorcycles. First introduced in December 1946, these motorcycles are now between 60 and 70 years old and yet still offer a special joy to their owners. The 'S' model designation has been suggested to stand for in-Series ; the in-line engine, its flywheel, clutch & gearbox. Conversely the 'S' might simply refer to the bike having a Shaft-drive. In the context of pre-war and immediate port-war-era production motor cycles, which were mainly oily side-valve singles - the Sunbeam was very advanced engineering. Most likely designed in Redditch, Worc during the latter years of the war, the S7's mechanicals are often likened to an automobile's engine & gearbox layout, complete with rubber mountings (..from 1947 onwards) and ignition by distributor & coil. But of course the Sunbeam motorcycle engine is twin cylinder and air cooled. Still, it's somewhat surprisingly that it took years before most other motorcycle manufacturers discovered the advantages of what later became known as 'unit construction'. Very unlike the average car or motor cycle of that era, the Sunbeam s7's motor featured a short-stroke OHC (Single Overhead Camshaft) with an all-alloy block and barrels (cast together as one) and then also an aluminium alloy cylinder head, each with all-internal oil ways. The pistons are also of alloy with four piston-rings, and these run in replaceable iron cylinder-sleeves. The engine's wet-oil-sump, its rocker cover, and its clutch bell-housing and gearbox, along with all engine/gearbox inspection covers, were likewise of cast aluminium alloy. The bike featured four-speed gears and a car-type dry clutch (..no primary drive chain or leaky case) with shaft-drive to the worm-type rear-drive (..rear-axle differential - in car terms). The rear-drive housing was again cast in aluminium, but its drive wheel is in bronze for smooth-quietness. The rear-drive's ratio was available for solo or sidecar use. The Sunbeam's duplex frame has sidecar mountings cast-in at the steering head and at the rear footrests. Comparable with other 500cc motor cycles of the time they produced 25bhp - from just 6:1 compression. There was no need for a decompression lever, and the distributor's auto-advance meant no advance / retard lever either. In fact these bikes are a doddle to start and to ride. High quality coachwork, excellent quality castings, quiet, comfortable and reliable, and (almost) oil-leak free - the Sunbeam S7 (and later S7-deluxe and S8's) were to the very highest motor-industry standards. But still., given the opportunity - they do like to be ridden with gusto :)) ..and their handling is better than most onlookers might expect. From an era when rigid/no rear suspension was still quite common (swing arms had not yet reached production motorcycles) 'other' bikes used a rear-sprung-hub. The flagship of the BSA group ; Sunbeam however featured plunger rear suspension - which offered greater suspension travel and accurate axle control. In comparison with the big-single motorcycles, and even the 'new' sporty (but vibrating) twins of the early fifties - the Sunbeam was, and still is., a very refined machine. In fact, despite modest performance - these bikes are perfectly usable even in today's town traffic and for across-country routes. Remember though to get out and about an meet up with other owners. For when two or more fellows riding a Sunbeam Motor Cycle meet up for a ride, or simply a chat over a glass of ale at The Old Bull and Gate - then you have have a Sunbeam Fellowship. The Sunbeam Owners Fellowship (the post-war Sunbeam Owners club) : S. O. F.
Update : 05th November 2014 Sorry but I am no longer taking work in - I have retired. But.. I'll leave this website in place though.., simply to share my love of the post-war Sunbeam motorcycles, along with some of what I've learnt along the way. Restoring an S7-deluxe - A case Study in Restoration. A new topic to share the ins and outs of a restoration as it happens. This is of one of my own Sunbeams, which came with an interesting history. It's been a long time since I've been on here.. but today I had to go to the hospital for a check up and decided the weather was nice to take the 'beam. Got 'Nudge' out and checked the tyre pressures ..both a bit low (the back one in particular) so took them up to 35psi. Checked the oil (the ol girl doesn't use very much oil at all, but throughout last year I keep using Nudge for 'just popping out' ..perhaps into town, or out for the afternoon ..and most often I'm keen / in a rush and things like this get neglected ..shame on me. As anticipated (because I do check it every now and then) it was midway between the dipstick marks, which is normal for this bike, and fine because it has the extended sump (with the all important extended pick up pipe too) which in effect means that there's an extra 3/4 litre in there before she's in danger. Then I checked the fuel, because I stole a gallon out for the lawnmower last month (yes, I know cutting an English lawn the week before Christmas sounds crazy !). And then because I use a gel battery on my bikes (which doesn't drop in voltage anything like lead acid batteries do) the charge was fine for starting. All being good, she started fine (petrol taps open, tickle the 600 carb, turn the engine over a couple of times with the ignition off.. And then a little tickle more and with ignition on - she starts easily (NB. I don't have a choke fitted to this bike so I leave her on a faster than normal tick over for a few minutes to warm up). Off for my hospital check up, then pop to the baker for a fresh loaf of granular bread, before heading out for an extended ride home (it's about 8 mile round trip to the hospital. Today I did 20+ miles just because I was enjoying the ride. )) The roads were flooded in a couple of places, which got me thinking about new tyres - as these are rather old now ..but the weather was very mild. Alas I also needed to get back and to do some jobs today ! After a cuppa of coffee I decided I give her a quick power wash, especially under the mudguards (I live down a dirt farm track !). And that was useful, because in doing so I noticed that the worm-drive's front seal has been weeping. Note to myself to swap that out sometime before I go any distance this summer. 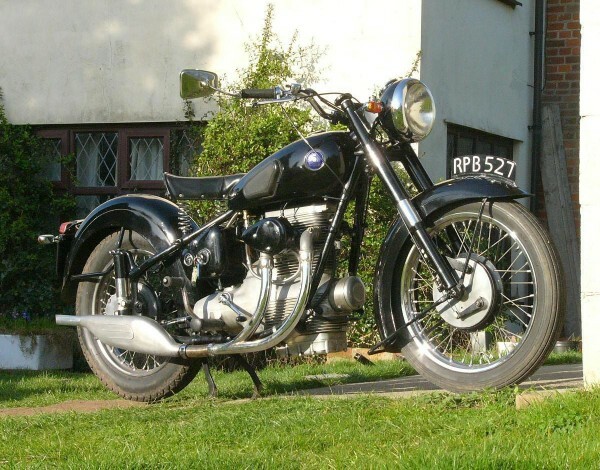 ...I've added another new page 'The Sunbeam S8, with it's new model announcement from October 1948, and then also Motor Cycling's first ROAD TEST..
D.W. Munro (M.I.Mech.E.) of Sunbeam Motor Cycles Ltd., Technical Department was handed the final design development into-production of the S7, after Mr Erling Poppe, it seems, was dismissed. I believe that Mr Munro was also responsible for the Sunbeam's further development into the S7-deluxe and S8 models. And was the author of the 'Sunbeam Owners Handbook' (maintenance and workshop manual). Following the update of 5th November 2014 ; Andrew Chapman's new Sunbeam (and Ariel) motorcycle restoration business is up and running. A former customer of mine has his s7-deluxe with the new company called Foxwood and I've been privy to the extensive 'Dropbox' photographic record and detailed written report on that bike.. Excellent work is being followed through. My best wishes go with Andrew in this new endeavour (the link to his website is below). Today I needed a break from the manual work of other projects, and so decided to spend some time reorganising this website. Quite a few of its pages had evolved like a scrapbook of work done ..And while that less-than-formal approach was easy to read, it was also terribly disjointed when looking for something specific. (Just follow the link in the left hand menu bar). ...do feel free to drop me a line with comments, arguments &/or advice that might be shared. edit (March 2017) : Sorry but I cannot now recommend Foxwood R&R. I'm sorry but I am no longer taking work in. I am winding the business down to retire. ..because you may still find some interest in it - I'll leave this website in place. I had hoped to extend it further - simply to share my love of these bikes and some of what I've learnt along the way. Ultimately, I would have liked to have researched & written 'the definitive guide to' the post-war Sunbeam s7, s7-deluxe, and S8 motorcycles, which would have incorporated an updated, practical workshop Recommissioning and Restoration manual.., but the advice received is that it would be uneconomical for me to do this as the market is simply too small. Over the next 12 months I'll have a number of bikes and projects to sell, if anyone is interested - do drop me a line.. But please, be patient for a response as I've got a lot on my mind right now. I'll try not to let any customer down (with work already booked in). Indeed, my intent is to work without a break until those bikes / those engines & gearboxes are done and returned to their owners, so that they be may enjoyed this summer. Many thanks to the wonderful customers who have entrusted their fine bikes and/or engines to me. And also to the suppliers, friends and SOF forum contributors who have helped and given me support. My gratitude and best regards to you all. 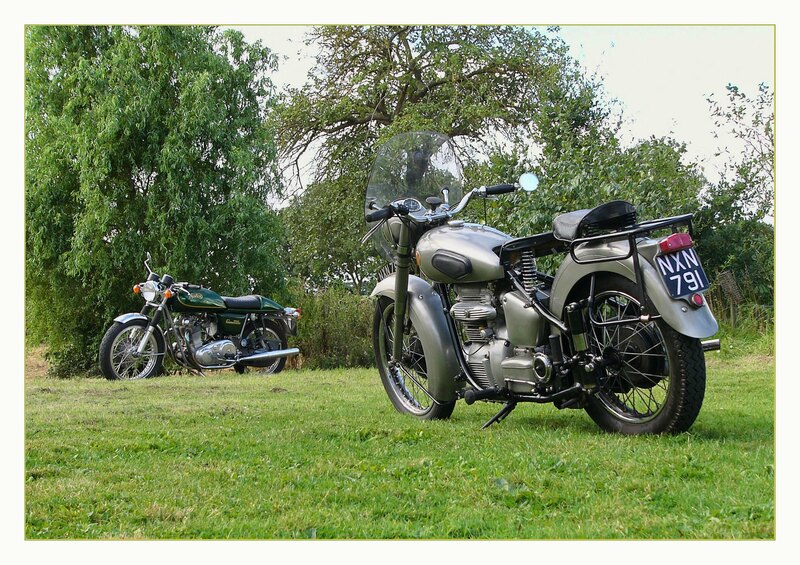 Welcome to the home of Sunbeam R & R (Recommissioning & Restorations) of the post-war S7 & S8 Sunbeam motorcycles. The company name pretty well tells you what I do : I recommission &/or restore the post-war Sunbeam S7 & S8 motorcycles. About me and what's the cost ? tell you more, and the fast-growing before & after photos show you some of the details, the problems found & work done. The Gallery celebrates the beauty of these bikes. But of course, behind every photo there were numerous things to do ! Unlike most modern bikes &/or cars, the parts for bikes of this age often have to be repaired and reconditioned - they cannot simply be swapped for something out of the stores.! I take in complete bikes, or just the assemblies (like an engine to be checked over, decoked, new seals, or whatever). I may be asked to diagnose and fix a problem, or to rewire the bike, rebuild an engine, gearbox, drive or any of the cycle parts, right the way through to fully recommissioning a bike. A bike may come in for a whole or partial restoration. The cosmetic side of things : paintwork, trim and chrome, differentiate this from recommissioning (which is 'making it work' !). Often I'm asked to recommission ('sort it out' !) a bike, and while easily accessible - to touch in chips of the paintwork. I also have damaged bikes (under an insurance claim) to repair and make beautiful again, and/or I might be asked to do an upgrade - like a modern / disposable oil filter, a revised breather, improved electrics, etc., or to add a non-standard item such as a pillion seat, a screen, or panniers. I'm also recognised by insurance companies to provide independent valuations for your policy's agreed value. Tip : Most of the photos on this website enlarge & open under a separate tab when you click on them.. The views expressed on this website are simply that - my own personal view. Nothing on this website is an instruction, nor an owners handbook, workshop manual, nor even a buyers or restoration guide. Stewart Engineering are the experts and have their own user's handbook. Other 1950's Sunbeam handbooks regularly come up on auction websites. ® Sunbeam name and logo used by kind permission of Stewart Engineering - Poole.